DISCLAIMER: I am NOT an attorney or law enforcement officer. The following is written based upon the perception of the council's actions and my interpretation of New Jersey's criminal code. 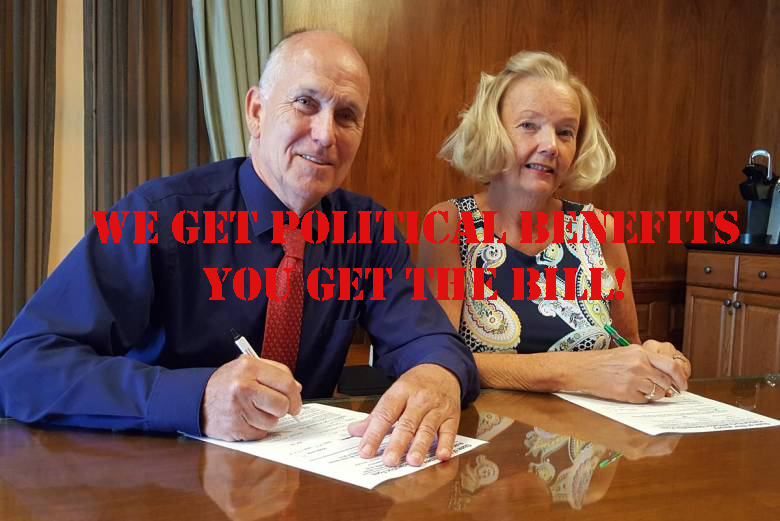 Mayor Labrosse and Deputy Mayor Canestrino are no new comers to the political process, or the dirty games of New Jersey "pay to play." After their election, they swiftly took care of their supporters (Rottino, Ammirato, Catania, and on and on..... SEE: Out with the Patronage, or is it?) with patronage jobs and made up titles. It all back fired costing the city hundreds of thousands, potentially millions, in lawsuits. Not to mention the egg on everyone's face when their city funded campaign manager under the guise of being the city's public relations consultant was the recipient of a deal by the prosecutor's office to give up his public employment not to be prosecuted (See: Political Consultant Escapes Potential Criminal Prosecution). But in this, their latest stunt, they may have potentially crossed the line into political bribery. 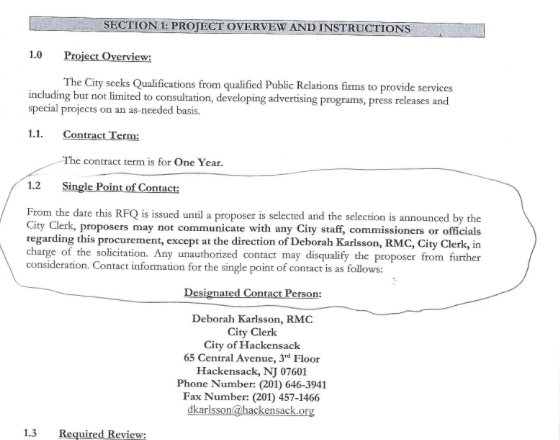 After the 2013 election, the council took care of their friend and politically ally Thom Ammirato rewarding him with a contract as the city's PR firm. He quickly began making press releases and news bulletins on the city tax payer's dime boosting the Mayor and Deputy Mayor (you know, campaigning on your dime!). Well, that all ended terribly. HACKENSACK SCOOP uncovered that Ammirato had a full time (no show) job with the County working for Dirty Donovan and Ammirato's public employments came to a halt after his signing an agreement for no prosecution with the Prosecutor. Something about these PR consultants is fishy, because they are at it again, but this time I think it may be worse! On June 14, 2016 the City Council voted to approve the qualifying of Visions Media. Then a month (give or take) later, they hired them as the city's PR firm. Visions quickly reinstated those shameless pandering "bulletins" that are mailed to the residents and sending press releases to the local media highlighting the "achievements" of the council. You know, free campaigning in this the last year before a reelection bid. On June 14, 2016 at the same meeting that they qualified Visions Media, the Mayor admitted that Visions Media's principal was involved in the creation of the now nationally disseminated press release that highlighted Labrosse and Canestrino leaving the GOP over Trump's "racist" commentary. Despite of course that their own Request for Proposal forbid contact with anyone other than the City Clerk during the hiring process! Labrosse exclaimed (in defense of the PR stunt) that the charade was AT NO COST TO THE CITY. Rightfully so, as it was not in the interests of the City. But who paid for it? I have been anxiously waiting for Citizens for Change to release their second quarter campaign filings. I have been hoping that they paid Visions Media for that press release. Well, they didn't! 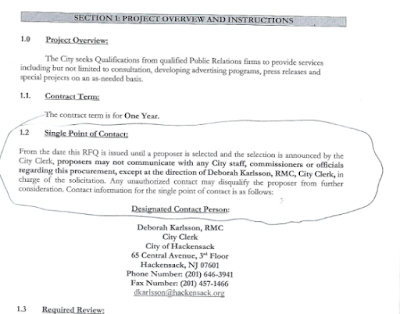 Seeing how the press release was completed BEFORE the hiring of Visions Media by the city, and Citizens for Change did not pay for the press release out of their campaign PAC, there is only one logical explanation--Visions Media did this press release gratis ahead of a lucrative contract with the City of Hackensack. Now you may morally question this. You may shake it off and say "typical New Jersey politics." My intuition instead makes me question how could this be legal? I took a few minutes and looked up New Jersey's criminal code trying to gain a better understanding. I found three areas of the New Jersey Criminal Code that peaked my immediate interest. Acceptance or receipt of unlawful benefit by public servant for official behavior. a.A public servant commits a crime if, under color of office and in connection with any official act performed or to be performed by the public servant, the public servant directly or indirectly, knowingly solicits, accepts or agrees to accept any benefit, whether the benefit inures to the public servant or another person, to influence the performance of an official duty or to commit a violation of an official duty. b.A public servant commits a crime if, under color of office and in connection with any official act performed or to be performed by the public servant, the public servant directly or indirectly, knowingly receives any benefit, whether the benefit inures to the public servant or another person, to influence the performance of an official duty or to commit a violation of an official duty. c.In addition to the definition set forth in N.J.S.2C:27-1, "benefit" as used in this act includes any benefit from or by reason of a contract or agreement for goods, property or services if the contract or agreement is awarded, made or paid by the branch, subdivision, or agency of the government that employs the public servant. 3) Trivial benefits the receipt of which involve no risk that the public servant would perform official duties in a biased or partial manner. e.An offense proscribed by this section is a crime of the second degree. If the benefit solicited, accepted, agreed to be accepted or received is of a value of $200.00 or less, any offense proscribed by this section is a crime of the third degree. 2C:27-11 Offer of unlawful benefit to public servant for official behavior. Offer of unlawful benefit to public servant for official behavior. a.A person commits a crime if the person offers, confers or agrees to confer any benefit, whether the benefit inures to the public servant or another person, to influence a public servant in the performance of an official duty or to commit a violation of an official duty. b.A person commits a crime if the person, directly or indirectly, confers or agrees to confer any benefit not allowed by law to a public servant. c.In addition to the definition set forth in N.J.S. 2C:27-1, "benefit" as used in this act includes any benefit from or by reason of a contract or agreement for goods, property or services if the contract or agreement is awarded, made or paid by the branch, subdivision, or agency of the government that employs the public servant. (3)Trivial benefits the receipt of which involve no risk that the public servant would perform official duties in a biased or partial manner. a. of this section is a crime of the second degree. If the benefit solicited, accepted or agreed to be accepted is of a value of $200.00 or less, any offense proscribed by subsection a. of this section is a crime of the third degree. (2)An offense proscribed by subsection b. of this section is a crime of the third degree. If the gift or other benefit is of a value of $200.00 or less, an offense proscribed by subsection b. of this section is a crime of the fourth degree. Today, Richard Salkin, Esq., a resident and tax payer (former City Attorney, former Municipal Prosecutor, current Board of Education Attorney) filed a lawsuit attempting to have Visions Media disqualified as the PR firm for the city. In Salkin's suit, he cites potential criminal and ethical issues with the contract award and calls for the contract to be nullified. When driving up Main Street you may have noticed an old faded and peeling mural on the side of Tati's Beauty Salon (along the Demarest Place side of the building). Well, thanks to Stephanie O'Connor, a local artist and the owner of The Artistic Giraffe (A local business offering paint parties and art classes), this mural recently got quite the facelift! 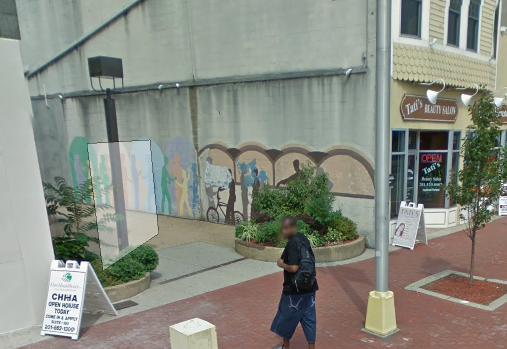 O'Connor has named this mural "What Lives Matter." O'Connor has worked with the City and local landlords to bring color and spirit to the community through several murals and projects, including another mural featuring several local artists at the corner of Bridge and Main Streets. Of the murals O'Connor says, "the City of Hackensack is strongly working towards bringing the arts back to Hackensack, and I am proud to be part of the strength and history."